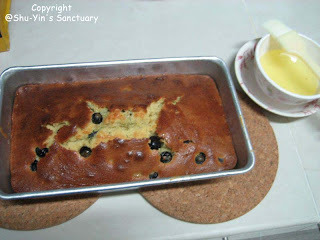 I tried a new recipe yesterday - Lemon Blueberry Bread. It was a little bit more expensive because I need to search for blueberries and fresh blueberries from Cold Storage does not comes cheap! For 250g is RM16....ouch! When it comes to baking, the other stuff which are expensive are butter and cream cheese. Other that that, all those normal stuff such as flour, eggs, milk, baking powder, baking soda are all pretty cheap and if u buy a box/bottle, u can use them for many times. 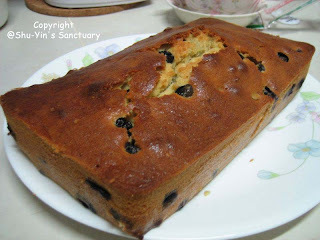 Anyway, my Lemon Blueberry Bread costs me around RM20 for ingredients - without counting electricity, gas and my time! 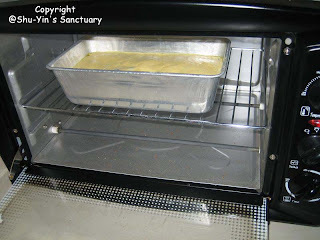 Forgotten to take pic of the batter. This is the 1st pic I took and it is already in the oven for 5 minutes. The Lemon Blueberry Bread still in the loaf pan after 55 minutes in the oven. 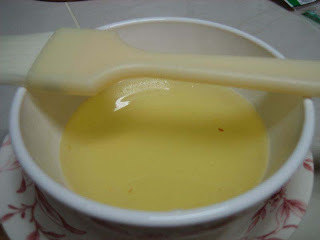 Lemon Glaze which is used to brush the top of the loaf to give that extra sugary lemon kick taste. Nicely 'pecah' and 'kembang' at the top of the loaf. The sides of the loaf. 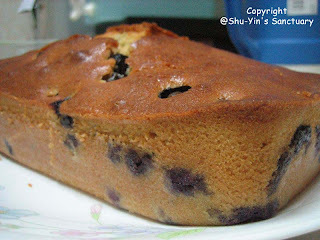 Look at those juicy blueberries oozing out from the bread. 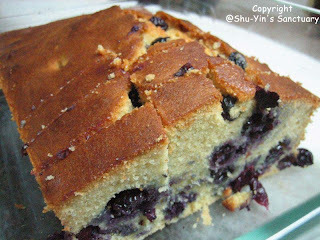 Mmm...imagine sinking your teeth into this delicious Lemon Blueberry Bread! Now I wanna think of what to use as substitutes to those expensive blueberries. Don't tell me raspberries...they are equally as expensive. Anyone has any suggestions? Frozen ones are as good as fresh ones as well. waleh! shu-yin de baker!!!! yalo once married we tend to become more 'wifely' cake making - not my cup of tea. me- love cooking dishes.must try ur cakes one of these days. kuku...i went to kuma's hse yest whole afternoon. didnt see u there also! oMG. must teach me next time! my mum used to make lemon bread and it is two die for. 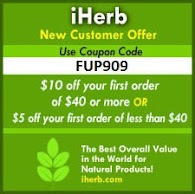 wanna swap recipes=p? i-mei...im juz a newbie nya. im sure ur mum's lemon bread is way nicer than mine!